Joe Villapiano liked the idea of being called an iron man. 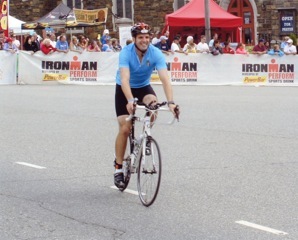 So, the 1999 graduate of Ocean Township High School, where he lettered in football, basketball and baseball, entered the Ironman Lake Placid. Held July 28 in New York’s Adirondacks region, it involved a 2.4-mile swim, 112 miles bicycling and a marathon run of 26.2 miles, held July 28. He said he maintained the philosophy that “three average times” in each event “equals a very competitive time” in the triathlon, his first. He did well: 1hour, 6 minutes, 53 seconds in the swim; 6:32:13 cycling; 4:26:50 running; or a total time of 12:27:02, which includes transitions from swimming to cycling and cycling to running. His transition times added up to 21 minutes, 6 seconds. “I think I had the slowest transition time of anyone in the Ironman, because I didn’t know what I was doing,” said Villapiano, who witnessed the 2012 marathon as a volunteer in the medical station. The overall winning time at Lake Placid was 8:43:29. Of 2,500 in the event, Villapiano finished 816, or in the top third. Harvard’s football players “look up to” his having done an iron man competition. “They think I’m crazy,” Villapiano said. “They understand it’s all about hard work,” something that is valuable on and off the athletic field. Villapiano is from a well-known local family. His family owns Seashore Day Camp in Long Branch. His father, John, who lives in Long Branch, played professional football in the World Football League and has been involved in politics — having served in the state Assembly. His uncle, Phil, who lives in Rumson, played in the National Football League. Joe Villapiano played football at the University of Connecticut, where he was a wide receiver, and had run six marathons — including the famous Boston Marathon in 2011 — before Ironman Lake Placid. “Running’s still going to be my thing,” said Villapiano, adding he wants to break 3 hours in a marathon; His best marathon was 3:09:34. Preparing for the Ironman, he had to overcome some obstacles, such as dealing with replacing his bicycle, which was stolen five weeks before the event. His mother, Patsy McMahon Villapiano of Ocean Township, said he had much support. “It takes a community to raise an iron man,” Patsy Villapiano said.